For years, Dynamic Displays has been modifying our LCD display monitors to meet our customer’s legacy monitor needs. We now offers a full line of LCD replacement monitors for most FANUC machine controls, including the Fanuc O, Fanuc 16, Fanuc 18 and Fanuc 21 Series Controls. 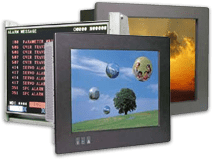 Each of our 9” Fanuc Monitor replacement LCD displays incorporate special timing and unique packaging to replace 9 inch Fanuc Control CRT models A61L-0001-0071, A61L-0001-0072, A61L-0001-0074, A61L-0001-0076, A61L-0001-0077, A61L-0001-0078, A61L-0001-0086, A61L-0001-0090, A61L-0001-0086, A61L-0001-0092, A61L-0001-0086, A61L-0001-0093 and A61L-0001-0095. We also have LCD replacements for 12” Fanuc Control CRT models A61L-0001-0077, A61L-0001-0078, A61L-0001-0087, A02B-0163-C382, A02B-0163-C384 and A02B-0120-C092. Lastly, we have LCD replacements for 14” Fanuc Control CRT models A61L-0001-0074, A61L-0001-0094 and A61L-0001-0096. We understand the importance of finding a fast, reliable and affordable solution to your Fanuc replacement monitor needs. That is why we have stock of the more commonly requested Fanuc monitor replacements and can provide same day shipment on those models if needed. The less popular models can be assembled and tested in just one or two days. So, our replacement Fanuc monitors are always available and ready to ship for new and returning customers. Fanuc monitor replacements carry a two year parts and labor warranty and excellent customer support.